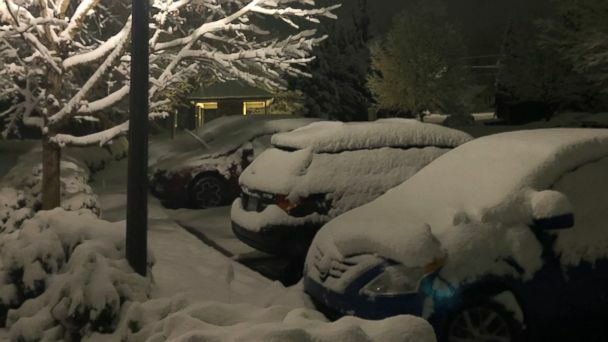 A major storm that dumped over 10 inches of snow on Lubbock, Texas, on Saturday swept into the Southeast on Sunday with heavy rain on the southern side and as much as a foot of snow in western North Carolina and Virginia. The "mammoth" winter storm has already dropped more than a foot of snow in North Carolina, with hours of snow and ice still to come, North Carolina Roy Cooper said during a Sunday morning news conference. "Enjoy the beauty, but respect the danger," Cooper said, urging residents to stay indoors and off the state's roads. "Don't be fooled, this storm is treacherous." He warned of icy roads and the likelihood of more power outages. Snowfall rates of 1 to 2 inches per hour are being reported in parts of western North Carolina and southern Virginia. Freezing rain is also falling in parts of central North Carolina at a rate of one-tenth of an inch per hour. In the mountains of western North Carolina, near Rosman, 13 inches of snow had already been reported Sunday morning. Waynesville, North Carolina, had seen 9 inches of snow as of 5 a.m., while Gatlinburg, Tennessee, received 7 inches. The same storm brought 7.96 inches of rain to parts of Texas, and over 6 inches of rain to parts of Louisiana. Winter weather advisories and winter storm warnings have been issued from central Arkansas to Maryland. Flood watches have been issued for parts of Georgia, Florida and Alabama due to the heavy rain. The radar on Sunday morning was showing a large swath of precipitation, in a classic comma-shaped pattern, from Arkansas to Virginia. Hourly rainfall rates of 2 inches per hour are possible in the Florida Panhandle and southern Georgia Sunday morning. The brunt of this storm will be felt during the first half of Sunday with very heavy snow in North Carolina and Virginia. The storm will try to nudge north into the mid-Atlantic later on Sunday, however, a high-pressure system bringing cold air to the Northeast should stop the storm's northward progression. However, snow is now forecast to reach well into parts of Virginia and possibly even parts of Maryland before the end of the day. Strong thunderstorms and heavy rain will continue in parts of Florida and Georgia Sunday evening as a cold front interacts with a relatively warmer, moist air mass. Some coastal flooding is possible Sunday along the southeast coastline due to onshore winds. This will be especially problematic in parts of the Charleston, South Carolina, area. The storm will slide into the Atlantic Ocean by Monday morning, with only a few snow showers remaining. Widespread snowfall totals over 1 foot are likely across much of western North Carolina and into Virginia. The snowfall totals have been nudged slightly up Sunday morning, with a little bit more of the heavy snow reaching Richmond and Harrisonburg, Virginia. The storm should stay south of Washington, D.C.
Major cities in North Carolina and Virginia will see significant weather impacts Sunday, including Raleigh, Greensboro, Roanoke and Richmond. Travel will be nearly impossible at times. Meanwhile, it is quite cold across parts of the northern U.S., most notably in the Northeast where wind chills are dropping into the lower 20s and teens. While the cold air is uncomfortable, it is the same air mass that is preventing the major snowstorm from traveling up the coast and causing major impact to I-95 cities.